Japanese stylist sporting an antique/vintage tan-themed street style w/ mesh turtleneck top, sheer pants, zipper sneakers and tote bag. 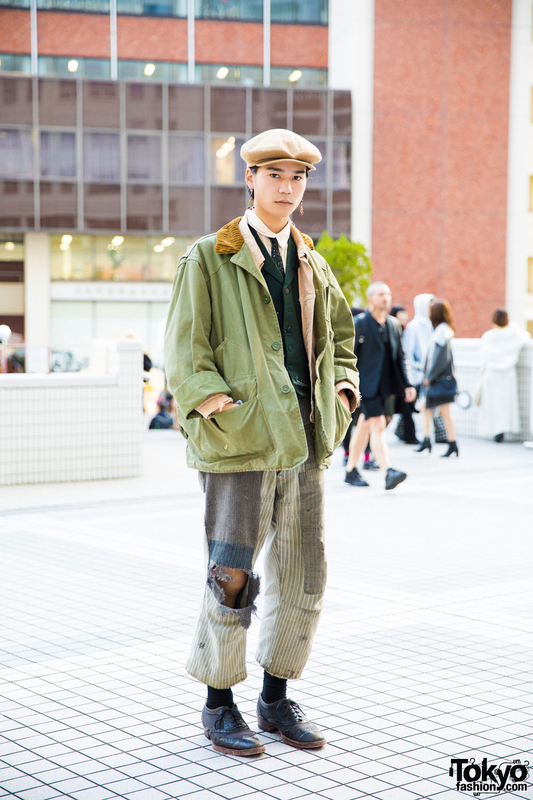 Japanese student wearing a vintage and antique street style with a 1920s coat, 1960s vest, early 1900s cropped pants, 1980s shoes, and 1950s accessories. 75+ pictures from the 7th Anniversary party of Grimoire Tokyo – one of Japan’s most influential vintage and antique fashion boutiques. 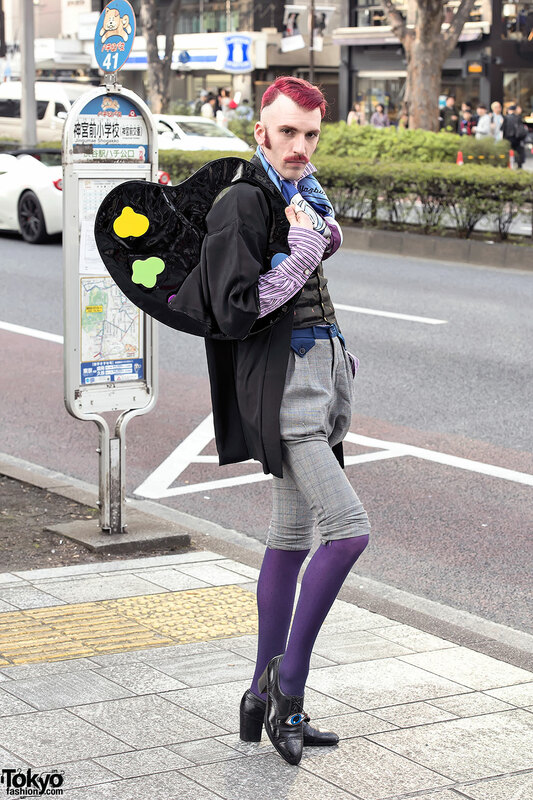 French stylist Aymeric Bergada Du Cadet on the street in Harajuku wearing an antique-inspired look with Yazbukey accessories. Dark Harajuku girl in antique fur coat with hood, antique bag, pointy toe ankle strap shoes, choker and spider ring. Beautiful vintage, antique, and Japanese Dolly Kei fashion on display at the Grimoire Tokyo 5th anniversary party – more than 150 exclusive pictures! Resale shop staffer wearing vintage and antique fashion with pink hair and vivid makeup on the street in Harajuku. 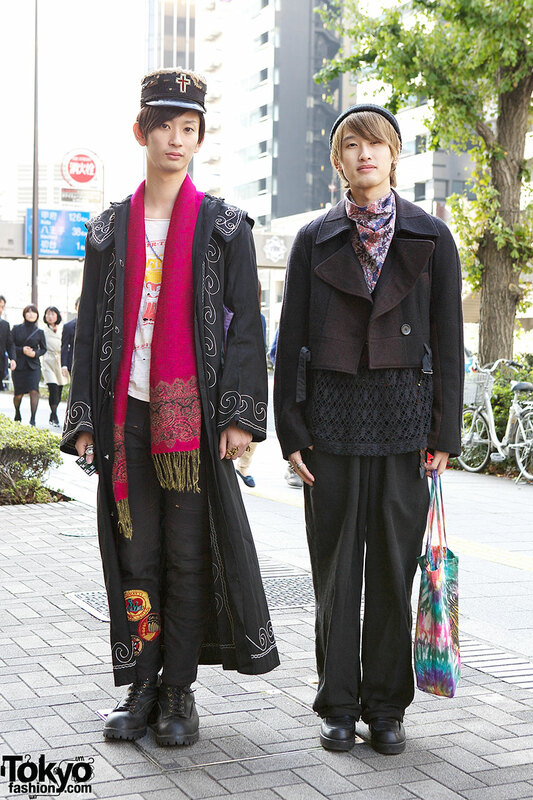 Two Tokyo guys wearing vintage and antique fashion with tie dye-tote bags. Two girls in Harajuku wearing vintage and remake fashion including a sheer skirt decorated with antique postcards and photographs from Barrack Room. 19-year-old Japanese student with a braids-and-bangs hairstyle wearing a vintage dress and vintage jacket along with Tokyo Bopper shoes in Harajuku.